Y’all. I ate squash for breakfast. Who am I? What have I become? Enlightened, that’s what. If you’ve been following me, you know that I have cut grains from my diet and stuck to a Paleo(ish) meal plan for the last few months. I do this on and off throughout the year. The main reason is due to my husband’s struggle with Ulcerative Colitis. When we adapt his nutrition plan, mine follows suite. 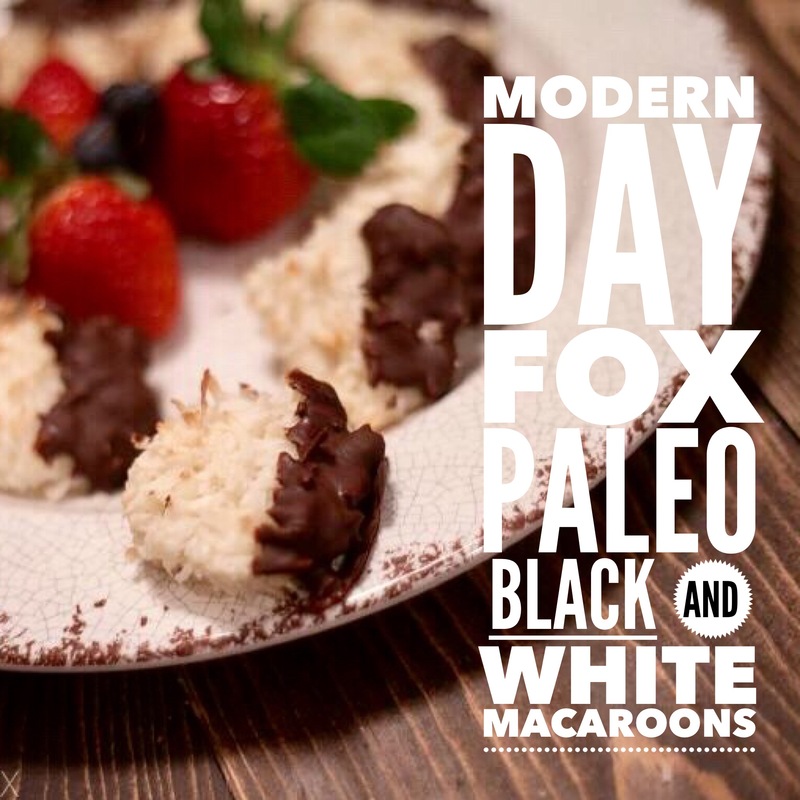 We are not strict text-book Paleo. We eat cheese and yogurt very frequently. And lots of meat and eggs. And I can’t take it anymore. Not only am I sick of eating meat, I’m also sick of handling it. I noticed within the last year that it was really starting to gross me out to handle meat, especially chicken. By the time we sat down to eat, I would sometimes lose my appetite. Recently, my friend started experimenting with Whole Food Plant Based nutrition and really peaked my interest. The recipes she was posting were very intriguing and made eating vegetables look a lot more palatable for this non-loving veggie girl. So, we are doing an experiment here at our house to see how the husband does with cutting back on meat. 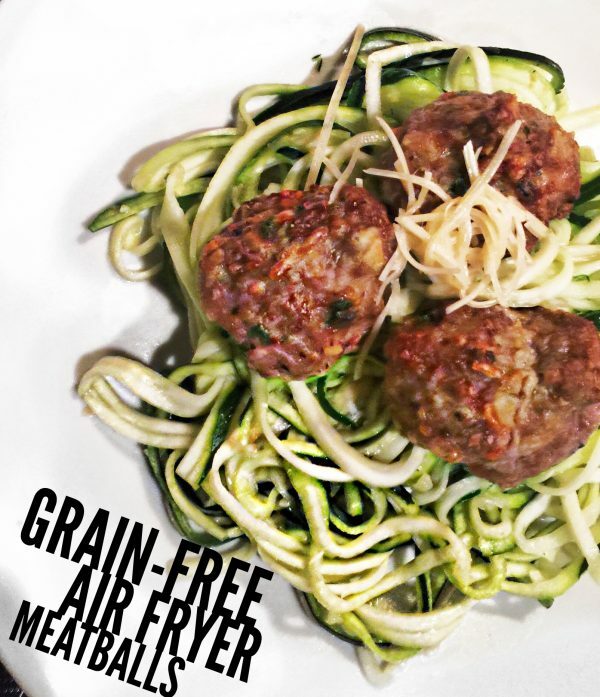 I prepped a week of vegan dinners using a free meal plan from Clean Food Dirty Girl. We are also incorporating SOME whole grains, and eating legumes and beans. My thinking is that although the simplicity of Paleo has been good for him in that he eats the same things daily, he surely can’t be benefitting from trying to digest (and eliminate) all that meat. It’s probably just sitting in his gut in massive quantities. So, let’s see how this goes! And, let’s eat squash for breakfast! 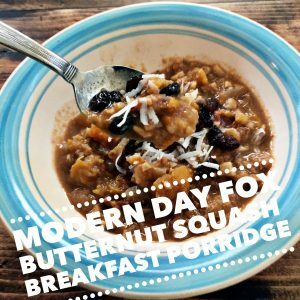 A great alternative to traditional oatmeal if you are cutting grains and seeking ways to get more plant-based meals into your diet. This is filling and healthy, and a great way to start your day! 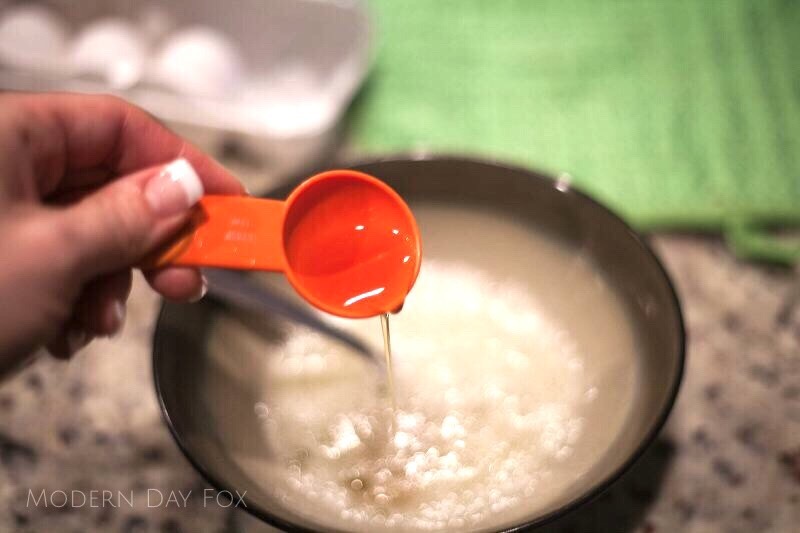 Soak one cup raw nuts overnight. Peel, chop and cube two cups butternut squash and two small apples. *TIP* If you microwave your squash before peeling for about 4 minutes, you will save yourself a lot of blisters and curse words! 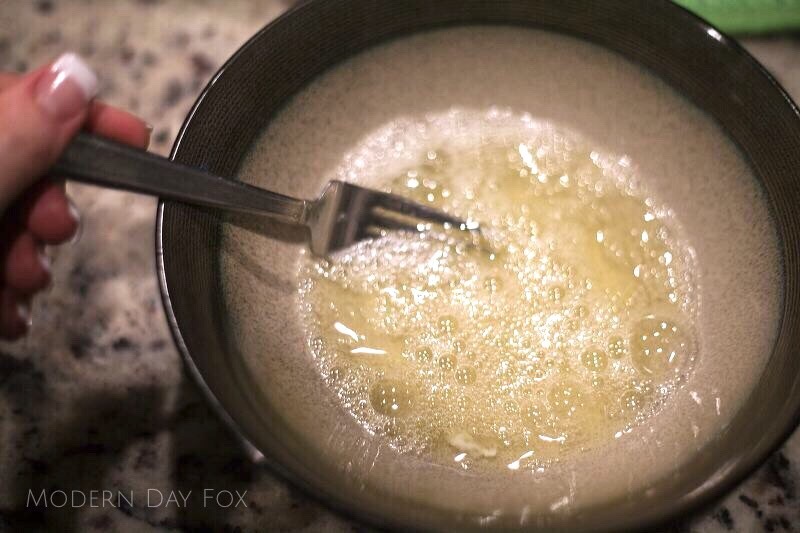 If you plan to use a date, drop it in hot water for ten minutes while you complete the next steps. Drain your soaked nuts and rinse them. Add to high powered blended and create a grainy nut flour. Add squash, apples and nut flour to inner liner pot. Add two TBSP coconut sugar. Maple syrup works as a sub or brown sugar if you aren’t concerned about highly processed sugar. Drain, pit and chop the date and add it to the pot. Raisins work too! Add one cup canned coconut milk (shake can well before opening). Add 1/4 cup almond milk. Stir well and put pot into IP. Replace lid and set valve to sealing. Set pot for 20 min high pressure and use a quick release. Remove lid and stir, breaking up chunks of squash and apples until the consistency is more like oatmeal. 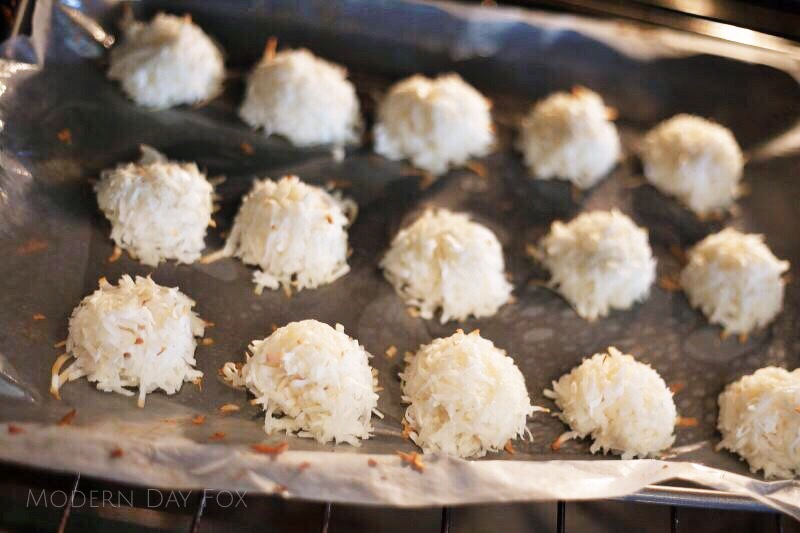 Serve in a bowl and add desired topping like coconut, raisins or nuts. I stumbled across a really tasty looking recipes on the Wegman’s website for Roasted Butternut Squash with Baby Spinach and Cranberries. 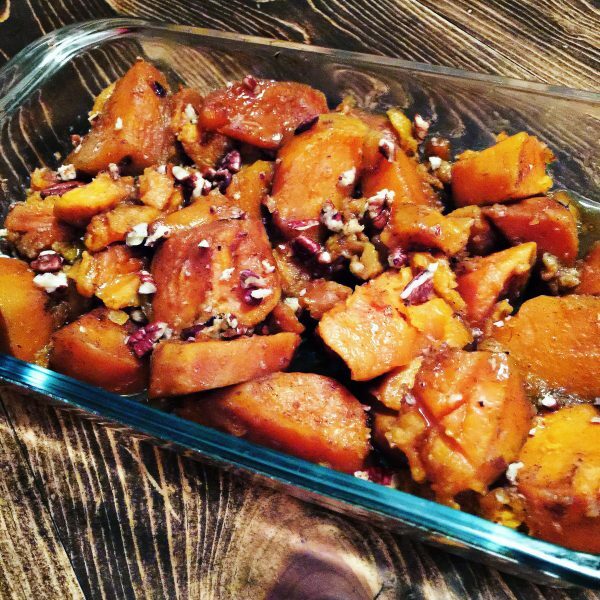 This looked like the perfect side dish for fall or for the Thanksgiving table, but I felt like it could also be turned into a delicious one pan dinner. These day I’m loving nitrate-free Apple Chicken Sausage. It’s one of the meats that my husband (who has UC) can handle in small doses. I love slicing the sausage and throwing it on top of roasting vegetables. Food prep doesn’t get easier than that. When I saw the Wegman’s recipe, I knew the Apple Sausage would compliment this dish perfectly, and walnuts would take it over the top. I was right! We loved this fall-inspired dish! Here’s a bonus tip – While you can certainly buy butternut squash that is peel and cubed already, it’s cheaper to buy a whole squash. 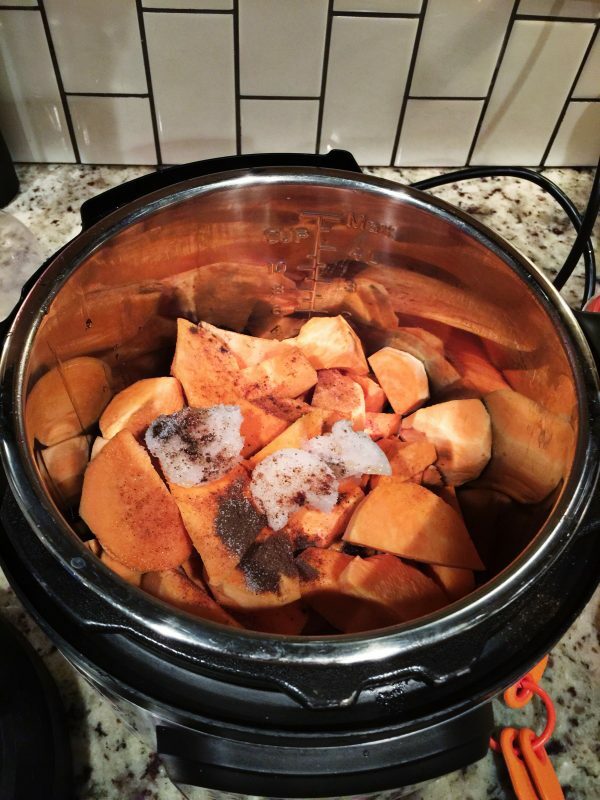 Microwave your squash for three minutes and then it will be so much easier to cut and peel. 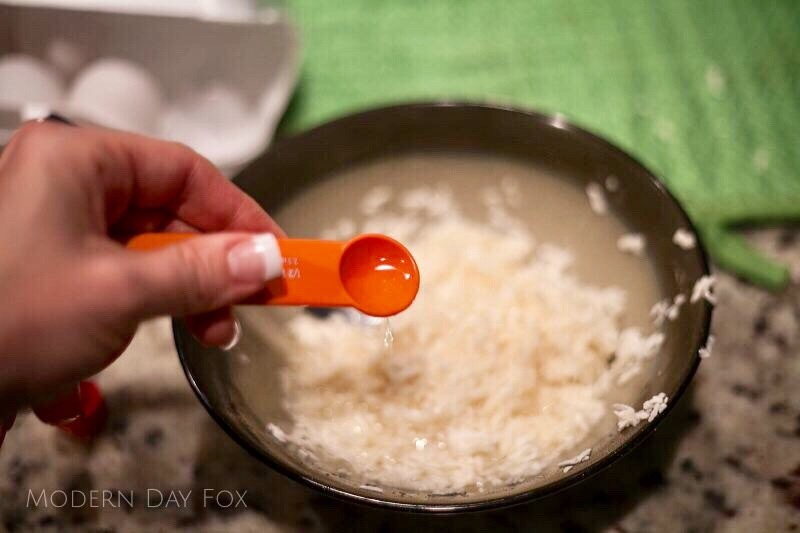 I use a peeler and it was easy, peasy! This one pan dinner was inspired by a recipe posted by Wegman's. See the link in my post. I bulked up the dish with some natural apple chicken sausage and walnuts, making it an easy fall-inspired meal! Peel and cube butternut squash. Roast in oven for 40 minutes. Slice sausage and add to roasting vegetables for the last 15 minutes of roasting. When vegetables and sausage are finished roasting, place into large bowl. 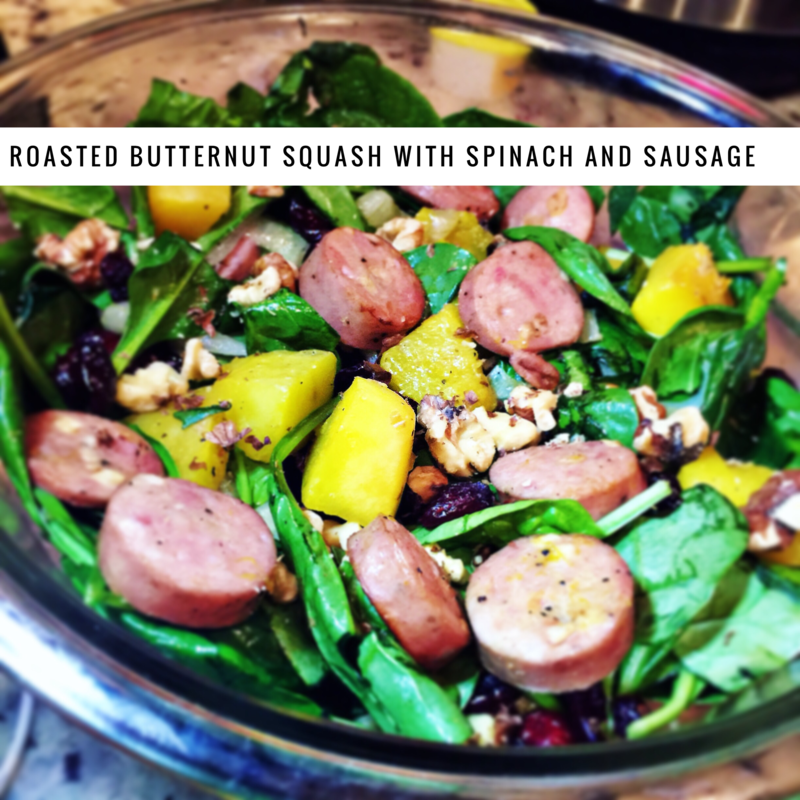 Toss with spinach, cranberries, and walnuts. We ate dinner tonight by candle light! 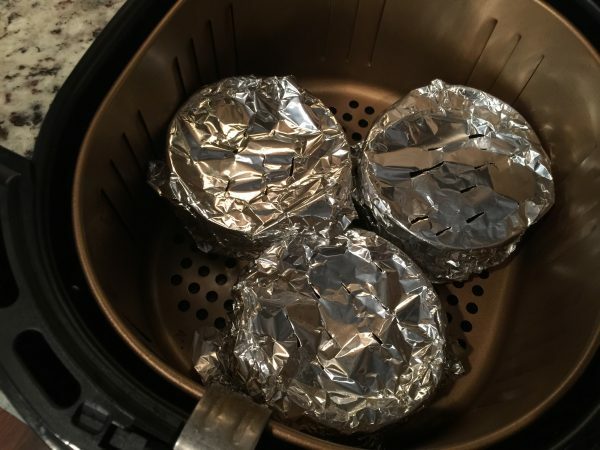 Thankfully for me, I zipped through dinner prep in less than 15 minutes using my Power XL Air Fryer and had everything done just as the power went out for the next 30 minutes. My kids thought it was pretty cool to have dinner in the dark. I was just thankful that my meatballs were not interrupted halfway through cooking. It would have been a real shame if those bad boys would have been ruined. 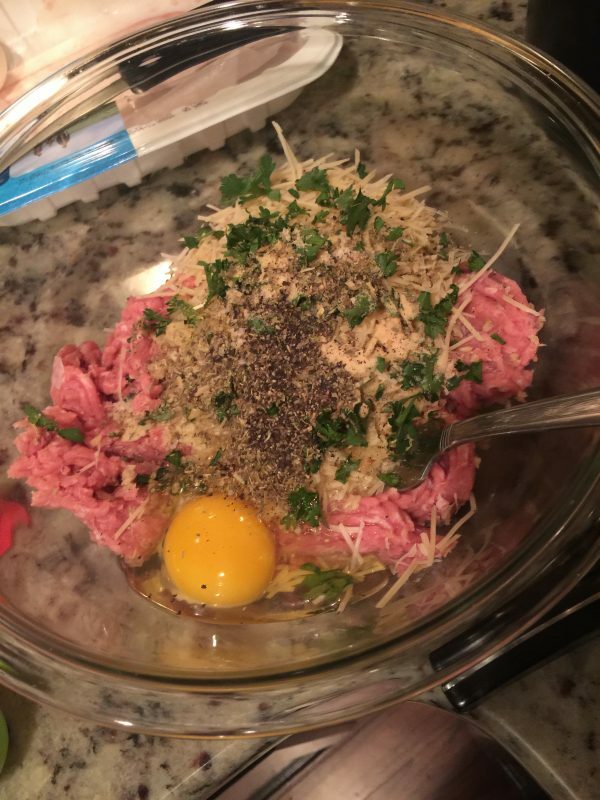 Since my husband went grain-free, I have found making meatballs without a binding ingredient such as bread crumbs or oats is pretty tricky. Too many times my meatballs ended up dissolving into mush and it was very frustrating. While surfing the web, I stumbled upon an idea for an unusual grain-free ingredient in meatballs and knew I had to give a shot. The magic ingredient? Potato chips! That’s right. Finely crushed potato chips is the perfect substitute for bread crumbs. It created a perfect texture and held the meatballs together extremely well. Now, I admit, I used Lay’s Potato Chips. Maybe not the healthiest choice. You can get organic potato chips, and I’ve seen recipes that use Sweet Potato chips or even beet chips. 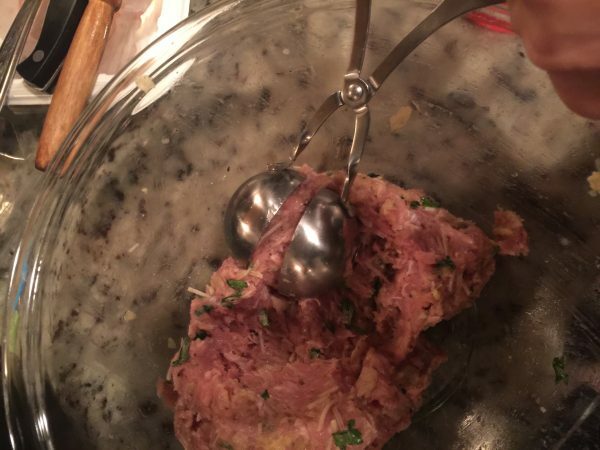 The other key to making perfect meatballs is using a “meatballer!” A what?? I know, I know. I’d never heard of such a thing either, but a friend told me about hers and I had to buy one. Take a look at the one I got here. I was able to portion out my meatballs evenly because of this neat little tool. I can already think of three questions that are going to come up, so I’ll just address them now. #1 I don’t have an air fryer. Can I bake these? Well, hello! Of course you can. I would try baking them at 375 degrees for 20-25 min until they reach 165 internal temperature. #2 Can I leave out the parmesan cheese? Sure! It won’t be exactly the same texture and taste, but it will still work. #3 Can I use flavored chips? I haven’t tried this yet, but I think it would totally work. I want to try using barbecue chips and simmering them in BBQ sauce. My only thought about using flavored chips is to make sure the other seasonings will work with the flavor of your chips. The Italian season, for example, might need to be swapped for a seasoning that compliments your chips. #4 Can I freeze these meatballs? You sure can. 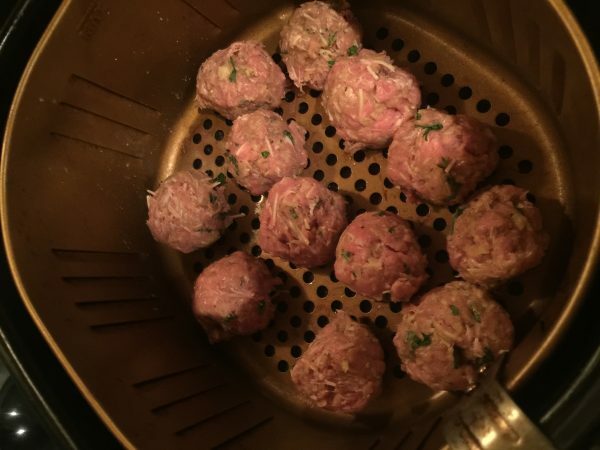 I have not tried cooking them from frozen in the air fryer, but I saw in some other meatball recipes that you would keep the cooking time the same as if they were fresh. Again, I haven’t tried it yet. This post contains affiliate links which help support the life of this blog. All opinions are my own and these are products I’ve actually purchase and recommend. 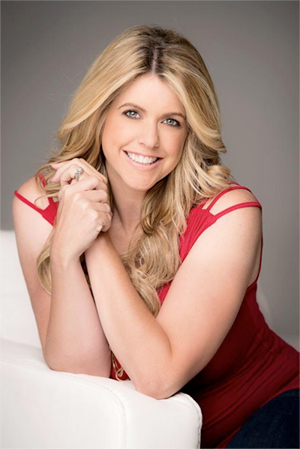 When you use my links to purchase, you directly support Modern Day Fox! 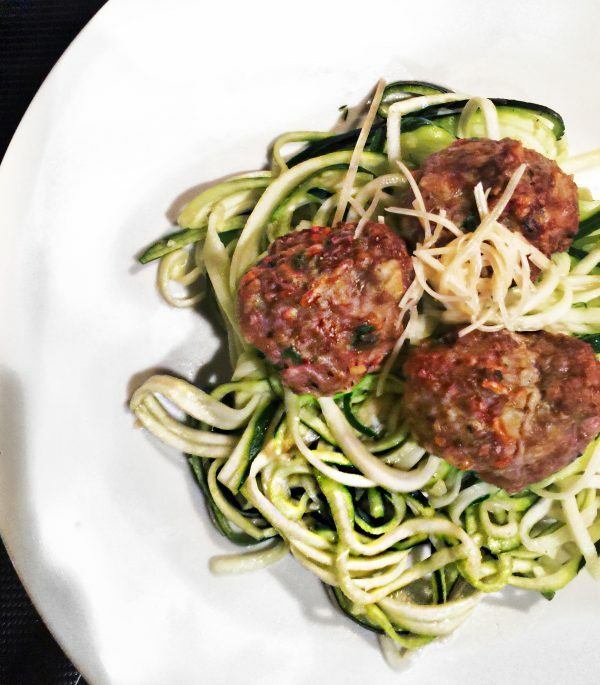 A surprising ingredient helps bind these meatballs perfectly, and creates a great texture! 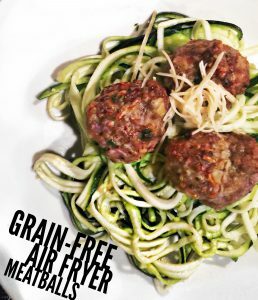 You won't even miss the grains usually used in meatball recipes. Try them served over zoodles! Mix all ingredients in a large bowl until thoroughly combined. Lightly grease air fryer basket with oil to help prevent sticking. Use 1.25 inch meatballer or scoop to form 12 equally portioned meatballs. 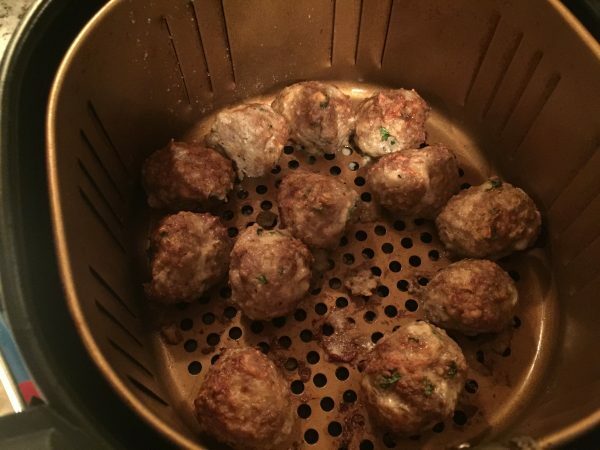 Place meatballs into air fryer basket. Remove from basket and serve! Meal prep can be overwhelming, but it doesn’t have to be! 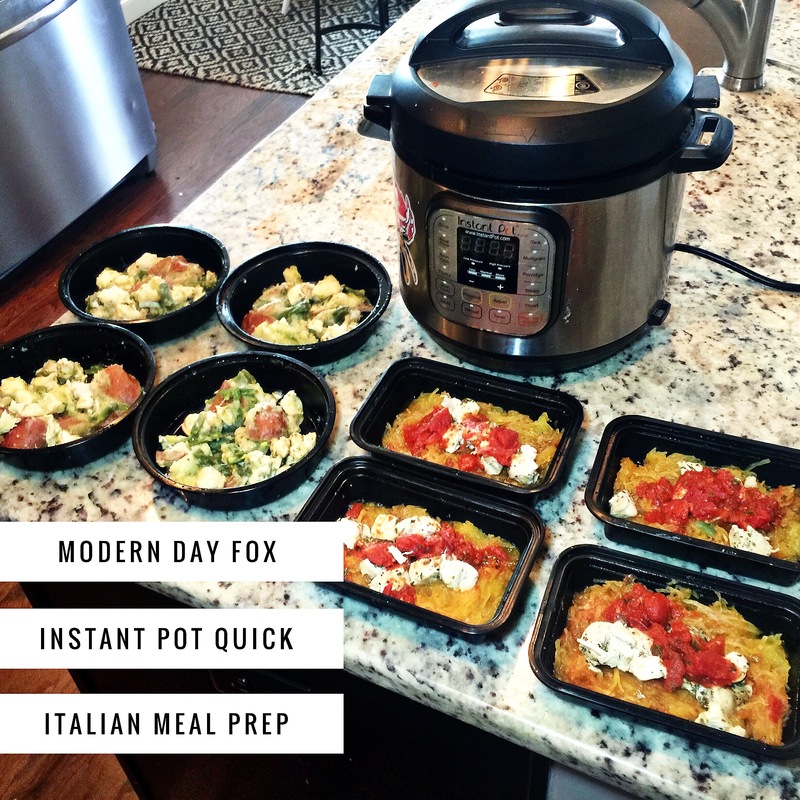 Instant Pot to the rescue! I’ve been experimenting with cooking spaghetti squash in the Instant Pot. 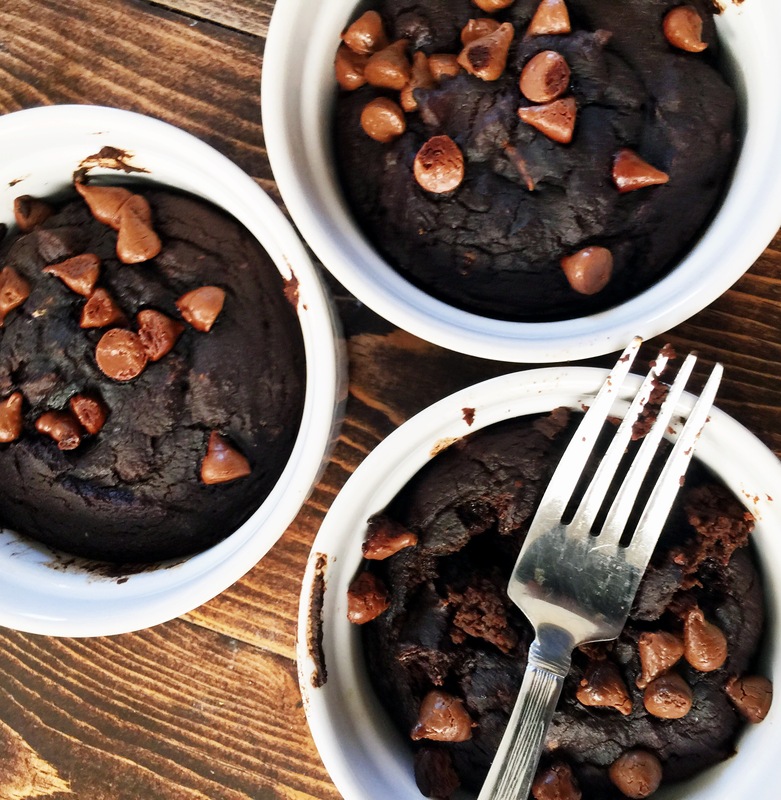 It is admittedly a bit of a different texture than when baked in the oven as it is cooked with moisture in the Instant Pot rather than dry heat. But, it gets done SO much faster and I like that. I love how spaghetti squash is so porous and takes on flavors so easily. I recently had a meal from my favorite meal service, Paleo Works, that combined spaghetti squash, chicken and tomato bruschetta. I decided to try to do a quick copycat recipe using my Instant Pot. While mine is admittedly a hack in comparison to that chef’s creation, I think I threw together a tasty meal. You can certainly make your own homemade bruschetta, but I use a jarred grocery store kind in this recipe in order to save time. I also have been exploring warm potato salads. Have you ever had a Hot German Potato Salad where the potatoes are slightly over cooked and starting to fall apart? The potatoes begin to fall apart as you stir in the dressing and it creates a thick sauce. It is so good! It occurred to me that I could create an Italian version of Hot Potato Salad using jarred basil pesto and red potatoes. I also threw in some green beans for a veggie kick, and chicken for added protein. 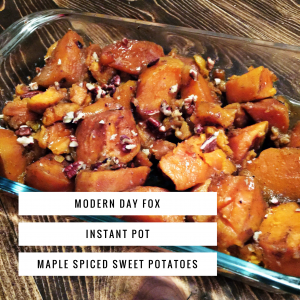 Best of all, I could cook it all in the Instant Pot at once! I made four of each of these meals for a total of EIGHT meals all at the same time in roughly 45 minutes. While the squash was cooking, I prepped the chicken, green beans, and potatoes. When the squash finished, I removed it and washed my pot. I then added the chicken, potatoes and green beans to the pot to cook on high pressure for 8 minutes. I scraped out the spaghetti squash and mixed in some tomato bruschetta. I portioned it out in four containers. When the pot timer went off, I released the steam and removed half of the chicken and evenly distributed over each of the servings of squash. I added a heaping spoonful of bruschetta on top of the chicken, and BAM! Four meals were done. Next I scooped out the potato mixture and put it in a bowl. I thinned out some jarred basil pesto with olive oil and then gently tossed the potato mixture with the pesto until it was coated evenly. I divided it into four servings, and BAM! Four more meals done! A couple notes: I tried the hot potato salad using frozen chicken. I cooked it for 13 minutes. It was good, but the potatoes were extremely soft. I think if you are using frozen chicken, then you should cook the potatoes and green beans separately for 8 minutes. Cook the frozen chicken for 13 minutes. Then, combine. Also, if you don’t like basil pesto, just use melted butter instead. I also made this with cilantro pesto and it was delicious! This prep is easy, quick, AND healthy. Get yourself an Instant Pot and give it a try! Interested in the mesh steamer basket shown in my instruction video! Grab it here! Or, try this one that was just released on Amazon! The links found in this post are affiliate links that help support the life of this blog. All opinions are my own, and I am not sponsored by any companies at this time. When you use my links to purchase, you help keep Modern Day Fox going! 8 delicious Italian meals in 45 minutes! 1 3 lb (approx) Spaghetti Squash Make sure it will fit in your Instant Pot! Shredded Parmesan Cheese, Walnuts or Pine Nuts For garnish, if desired. Slice spaghetti squash in half, lengthwise. Spoon out seeds and strings. Place halves in steamer basket and into liner pot. Add one cup water. Set pot to manual high pressure for 4 minutes and allow 5 min natural release. If you like firmer strands of spaghetti squash, you may opt to do 3 minutes instead. While squash is cooking, cube red potatoes. Trim ends from fresh green beans and cut into thirds. Cube raw chicken and season with salt, pepper and Italian seasoning. You may choose to add additional seasonings of your choice. I typically add a garlic seasoning from Sprouts that I like. When Instant Pot timer goes off and steam has released for five minutes, turn the valve to release remaining steam. Use an oven mit to remove squash from pot. Allow to cool. Add potatoes, green beans and chicken (in that order) into pot. Add one cup broth. Replace lid on pot, turn valve to sealing, and reset to 8 minutes high pressure. While the chicken and potatoes are cooking, use a fork to scrape spaghetti squash out of its skin. 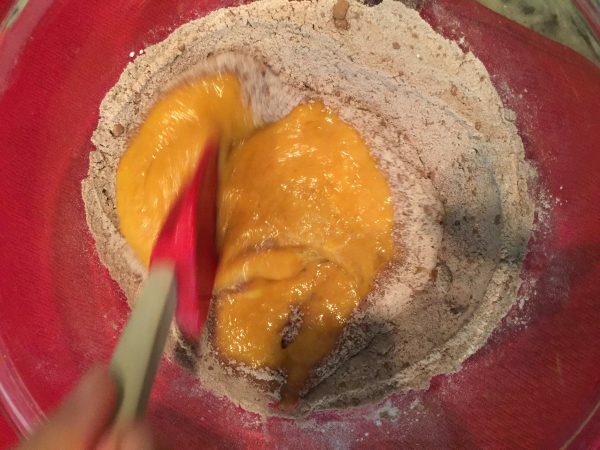 Transfer strands to a large bowl. Stir in 6 oz (half the jar) of Tomato Bruschetta. Portion out squash into four meal prep containers. When timer goes off in Instant Pot, use a quick release for the steam. 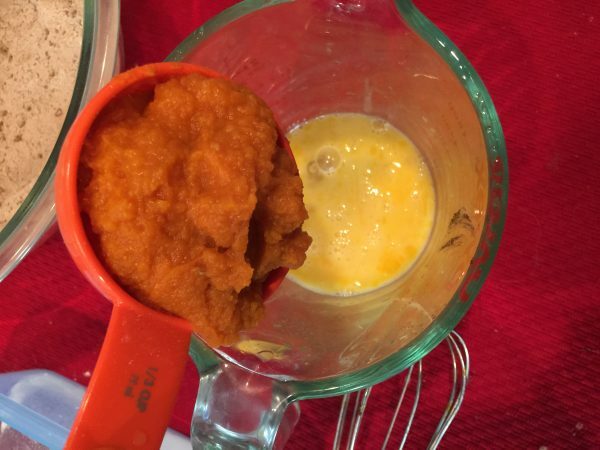 Use a large spoon to scoop out half of the chicken chunks and evenly portion in each container on top of the squash. Spoon remaining Tomato Bruschetta evenly across all four containers over the chicken chunks. Garnish with shredded parmesan cheese, if desired. Carefully use a slotted spoon to scoop the remaining chicken, potatoes, and green beans out of the pot. Potatoes will be very soft so handle with care. Discard broth that remains in the pot. Combine pesto and olive oil in a small bowl to thin it out a bit. Spread pesto over chicken and potato mixture, and carefully toss to coat evenly. Distribute to four meal prep containers. Garnish with shredded parmesan cheese and walnuts or pine nuts, if desired. 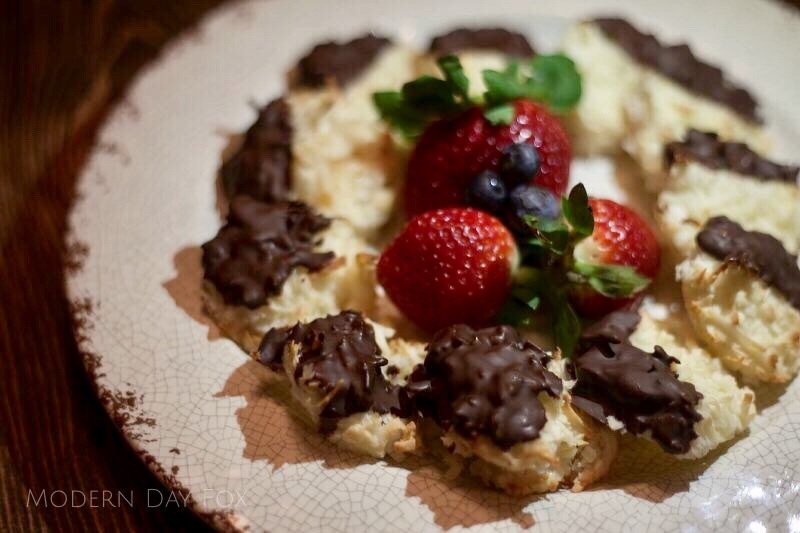 I’m on my fourth week of removing grains from my diet and on cue (usually lined up with a certain time of the month, if you know what I mean), I’ve started craving dessert. I saw where you could cook cakes in the air fryer, so I just had to give it a shot. I kind of threw this recipe together as a hail Mary after looking at some similar recipes I have made in the past and not having all the ingredients needed on hand. I have to say that I came up with a combo that hit the spot! 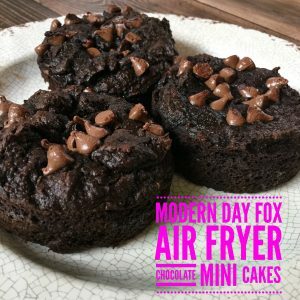 These would be fantastic with a Paleo frosting, but I sprinkled on chocolate chips instead. Full disclosure – these are regular chocolate chips. I typically use EnjoyLife chips, but I was all out today. I tolerate dairy just fine, but I wanted to be honest about my photos since my chips are not Paleo. EnjoyLife Chips are non-dairy and cook just like regular chocolate chips. They are amazing! I hope this turns out well for you. Before you ask, I have not baked this recipe in the oven yet, so I can’t say what the cooking time would be. My advice would be to set your oven at 350, cook it for 15 minutes and then check every few minutes after to see when it is done. One other note – all air fryers vary in cooking time. Keep in mind that I used a Power XL Air Fryer and this timing worked out for me. You may want to check your cakes at the 10, 12, and 15 minute mark to make sure they do not overcook. Good luck! This post contains affiliate Amazon links which directly help support this blog. When you purchase items using my links, you directly support Modern Day Fox and keep it alive! My opinions are my own and I have no sponsorships. These are purchases I’ve made and love! These delicious grain-free chocolate mini-cakes are sure to put a smile on your face!! 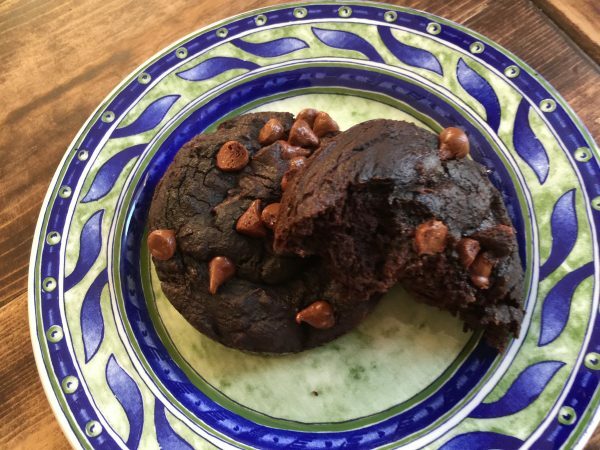 1 TBSP Non- Dairy Chocolate Chips Enjoy Life are awesome! You can use regular chips if you can tolerate dairy. Sift together all dry ingredients in a large bowl. 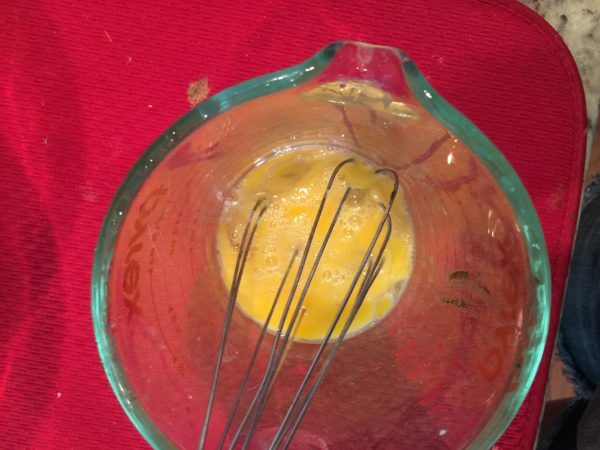 In a separate small bowl or glass measuring cup, whisk eggs together. Add to the eggs all of the remaining wet ingredients and stir until completely smooth. 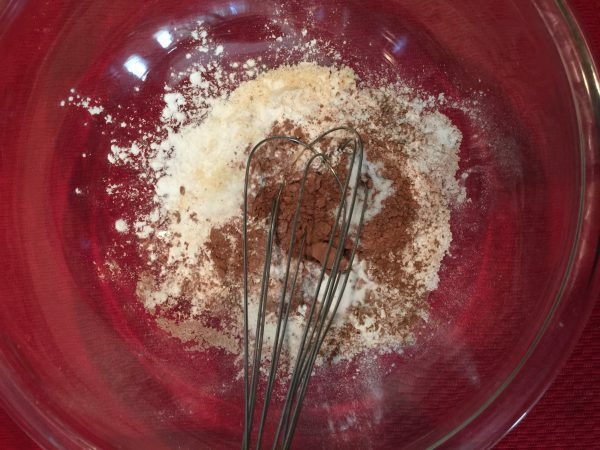 Stir wet ingredients into dry ingredients until well blended. 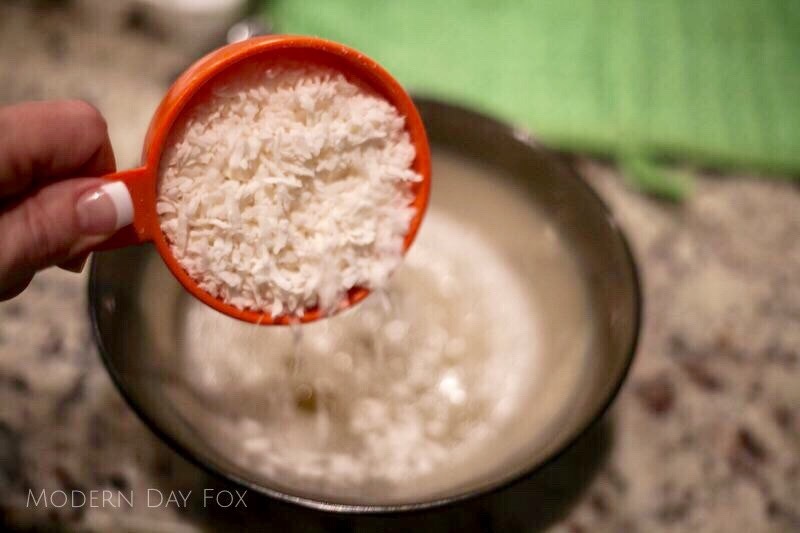 Grease ramekins with coconut oil. 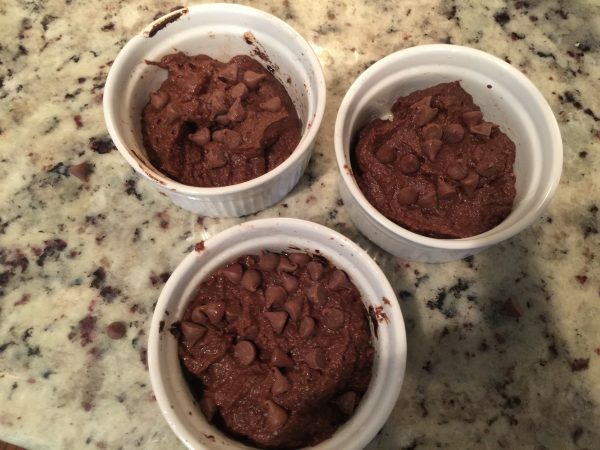 Pour batter into ramekins in equal parts and sprinkle each with chocolate chips. Cover each ramekin with foil and use a knife to cut several small slits on top of the foil. Place ramekins into fryer basket. Remove foil and allow to cool.